The Argentinian dairy union's technology education center in Sunchales, Santa Fe is a modern well designed facility aimed at providing university level education in the skills of dairy processing, research and innovation. 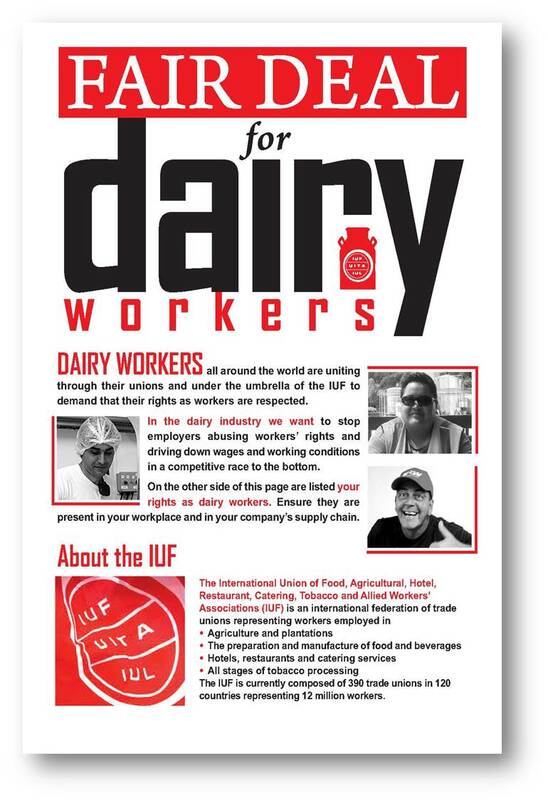 The IUF is issuing an initiative of a Fair Deal For Dairy Workers(FDFDW) to demand that their rights as workers are respected. In the dairy industry we want to stop employers abusing workers' rights and driving down wages and working conditions in a competitive race to the bottom. Like a shook-up can of Pepsi, PepsiCo company is bubbling over with plans for its Russian operations. After four relatively quiet years since taking over leading dairy producer Wimm-Bill-Dann (WBD), PepsiCo has announced it is to 'quit the farm' - focusing solely on processing. Brown Cow Yogurt owned 80% by Danone will shut down its Antioch operation and move production of yogurt from its current location in Antioch, California to a facility in Texas within Groupe Danone. The IUF affiliated Teamsters let the negotiations for its members to be effected by the closure with the support of the IUF. The inauguration of the new national board of the Argentinian Dairy Union, ATILRA was held on January 8 where General Secretary Hector Luis Ponce was applauded on his election for a further four year term. ATILRA has 27000 members who all work in the dairy sector, a large increase since Hector Ponce was first elected General Secretary 12 years ago. On August 2, 2013, Fonterra issued an alert concerning a possible contamination of certain ingredients supplied to Danone. Additional tests revealed later on that it was in fact a false alert. The campaign by the IUF-affiliated Milk Food Factory Workers Union against union-busting by GlaxoSmithKline (GSK) Consumer Healthcare at its dairy products plant in Nabha continued into its 54th day. Before and after every shift 400 workers join meetings outside the factory gates while inside union members peacefully boycott the canteen and refuse overtime.